This post came to me in an unusual manner. I normally work through my ideas for writing for several weeks and sometimes actually film or photograph specifically for the topic I plan to discuss. At any time I am usually planning or working on several posts. Even now there are are three others in process, ranging from a discussion on ammunition for my .308, to full preparation for the upcoming Alaska adventure, and one even entitled, "The Subway Sandwich"-- stay tuned in for that one, I think you will enjoy it. The idea for this post came to me on Father's day while I was on the phone wishing my father a happy day. I spoke with him about several adventures we had together and what he had taught me over the years. The thought was to write about those who helped to create and foster my love of hunting and helped to make me the outdoorsman I am today. So without further explanation I bring you the article, "Forerunners." Forerunner - noun - a person or thing that precedes the coming or development of someone or something else. - the almighty Google. My lessons in hunting started early in my childhood. For as long as I can remember I was bundled up in heavy winter clothes and loaded into whatever hunting truck we had at the time to tag along on my parent's outdoor missions. We were a hunting family and game meat was nearly always on the dinner table. My parents felt it was important to spend time in the woods as a family and there even was several rather macabre slogans for the Robertson household. The ones I particularly distinctly remember were, "The family that slays together, stays together, " and an adaptation of a quote from the movie, "Predator": "If it bleeds, we can kill it." Looking back and from an outside perspective I can see how some might find this internal family banter as disturbing, but for us it was normal family life. My father taught me many things about the outdoors. From teaching me how to shoot a rifle and bow, to how to rebuild an engine and fix your vehicle when it breaks down in the middle of nowhere. My mother was always there on the finer points of skill sets. She taught me how to butcher animals, the best way to prepare the meat, how to sew, and how to be patient in hunting situations. 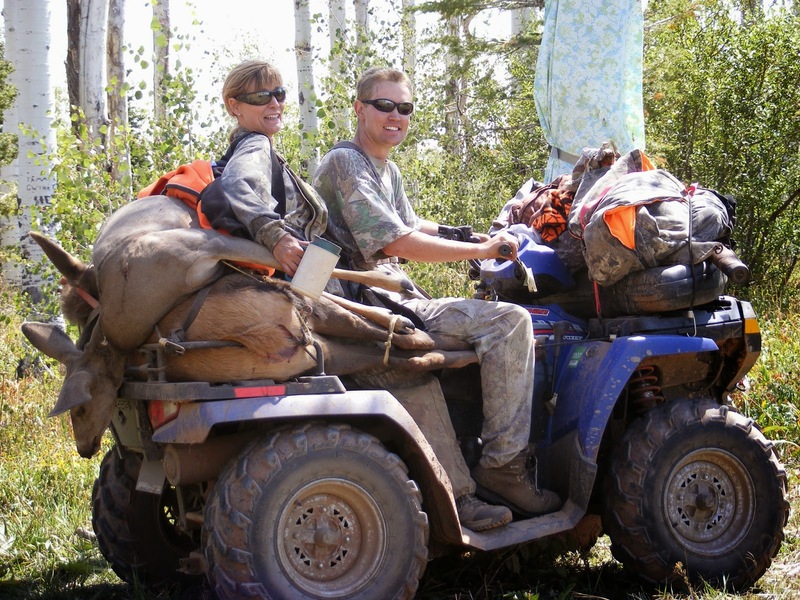 Off and on throughout our hunting careers I have hunted with my parents individually, and at times again as a family. It seems to me the best way to demonstrate some of the lessons they taught me is to share some of our adventures together in several mini-stories. This occurred in the fall of my fifteenth trip around the sun. I was hunting with my father and we were heading back to camp after an unsuccessful morning hunt. As we were driving along the mountain road we came to a curve in the road that rounds a point of a red rock formation that is bordered on the low side by an aspen grove. Years later this specific section of road would be named by us as, "where the road turns red," I never said we were a very creative bunch... The road is cut into the steep slope, and there is a drop off on one side that makes novice four wheel truck passengers white knuckle the armrest. It was down this slope that my father was starring when he suddenly stopped the Suburban and announced he had just seen the biggest buck of his life. True to his statement, not only was there one massive 5x5 mule deer about 80 yards down on the border of the aspen grove, but he was sparing with a second equally beautiful buck. 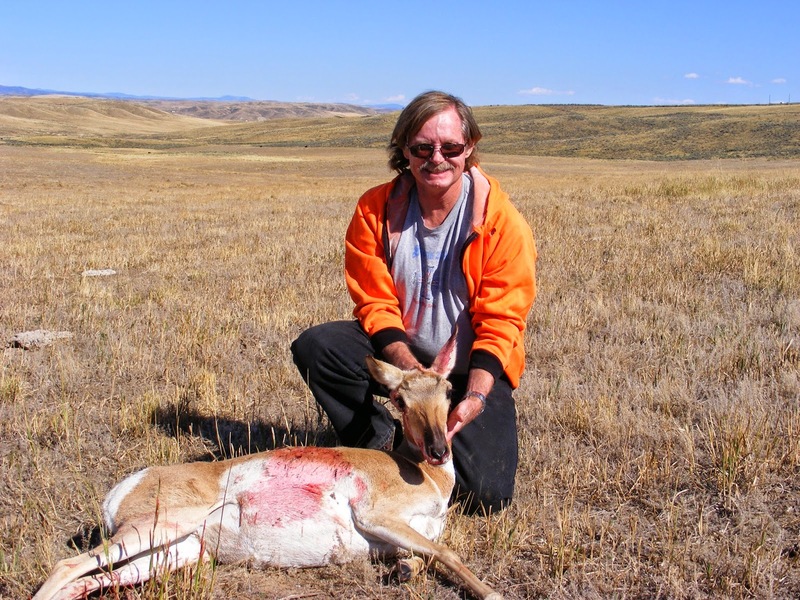 My father grabbed his bow and bailed out of the truck to head down the hill for the animals. It was clearly his turn to chase these deer. For the previous week he had graciously and patiently watched me fail to connect on stalk and shot after shot. Thus I was left sitting and waiting for the results of his pursuit. A short time later I heard my father yell he had gotten one, and to come down the hill. Sliding down the rocky scree with my bow in hand, I marveled how my father had been able navigate this same hillside quietly. When I arrived, I found my father standing in the aspen grove pointing to a tree. Embedded in the tree was an arrow covered in blood. I was very excited to see the large buck on the ground; however, a short blood trail led to a young spike buck. To say the least, I was very confused. My father told me how he had snuck up on the big deer and was waiting for a shot when a little buck had come up the slope and stood a mere 15 yards away. My dad saw the deer tense when it scented him and he knew the game was up. He had to make a decision to either take the small deer, or let him sound the alarm and lose all of them. He chose the proverbial bird in the hand and shot the spike. This would be interesting story if it ended here, but alas this is just the backdrop to a very humorous tale. I had wisely taken my bow down the hillside with me and I was glad I did when the 5x5 buck began walking directly towards us from the bottom of the hill. He had disappeared when my dad had shot, and now for some reason decided to return despite all the noise of my dad yelling and us following the blood trail. My father and I froze, standing as still as possibles as we were caught in the open and had no cover close to conceal us. 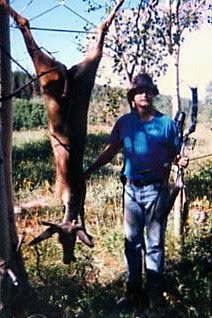 I watched as the buck that haunted my dreams approached us, seeming unaware of the shaking 15 year old boy with a PSE compound bow in his hands. When the buck hit the 30 yard mark he turned broadside, put his head down and started feeding. It was a textbook shot, and an easy one that I knew I could make. I felt my father nudge me and knew he was telling me to take the shot. I pulled back the bow and I honestly can not remember releasing the arrow. What I do remember is the arrow sailing over the buck's back and disappearing into a large bushy fur tree behind him. Later I would learn the buck had been less than 20 yards away. Dad with the spike buck. The deer bolted and ran around the right side of the tree. I quietly pursued him, cursing myself along the way for such hasty shooting. I turned around the right side of the fur and could not see him. Figuring he had run into the next county I turned around and saw my father standing very still, as if he was a statue. That was except for the large grin on his face and motioning with his hand subtly to the left side of the fur tree. I dutifully proceeded to go around the left side of the fur and once again found...nothing. I again looked to my father who was now pointing to the right side of the large tree. I was confused, frustrated, and getting more convinced by each passing moment that this was some kind of sick game he was playing. Nonetheless, I again went to right side of the tree and there again was nothing but fern, trees, and now a mad teenager. It was at this time my father erupted in full riotous laughter. What had happened was my dad had a front row seat to the greatest game of ring around the roses a person can hope to see. The buck had returned for a third time and each time I would go around one side of the tree he would appear on the other. Neither one of us knew where the other was, but both of us timed our movements perfectly to not see one another. Finally, after the third go around, the deer had decided the game was up and run off, allowing my father to finally let out the burst of laughing he could no longer contain. I learned many things that day. Lessons in stalking, shooting, patience, and even a little humility. I was very disappointed at losing the buck, but looking back, I think the story is more dear to me as it stands. It is an interesting fact that I have actually spent more time hunting with my mother than my father. I am happy that this breaks the typical stereotype of male dominated hunting camps. Often members our fall hunting camp return to the city and leave the camp empty, except for my mother and I. It was during one of these particular periods of time this story occurred. It was raining, it had been raining, and it was going to be raining for the next several days. This particular storm eventually set off a series of floods that had tragic consequences for the communities in lower elevations of Colorado. For us at camp with a 9,000 foot elevation, it simply meant it was wet, cold, and muddy. We had holed up in the campers for the prior two days watching movies, fueling the little generator, and waiting for a break in the rain to climb back into our tree stands. “I bought rain gear for a reason, and it was not to sit idle in my pack.” I believe this was my statement when I decided enough was enough, and rain or not I was going hunting. I knew what I was in for: a 45 minute four-wheeler ride over rough muddy trails, through a downpour, followed promptly by sitting in a tree stand for four hours while the rain took no mercy. I was surprised when my mother readily agreed to join me. Covered in mud, and already discovering there were several leaks in my rain gear, we arrived at our hunting location. The tree stand we were hunting from was in a clearing in the middle of a dense aspen grove. This particular stand overlooks a small watering hole and is an excellent set up for elk, deer and bear. Indeed, two elk had already been claimed by archers of our camp that year, and the kill sites were close by. All of the meat had been removed, but the offal and bones that remained, which meant the bears would be around. We had placed two tree stands in one tree, and they were positioned back to back to cover all directions in the clearing. We sat in silence, listening to the rain pelt our hoods and hoping the storm would not send a bolt of lightning in our direction. Shortly before sunset, the clouds broke for a brief time and turned a dark and dreary evening into beautiful golden colors of amber light. It was about the time that I was thanking the weather gods for the respite when I felt a tug on my right side. It was my mother grabbing my clothing to alert me of something. Turning toward her, I followed her gaze to see a black bear enter the clearing about 60 yards away. Immediately the bear disappeared among the logs of fallen aspen tree. The bear did not reappear, and just about the time I had given up hope of seeing him again, he stealthy materialized 20 yards in front of us, standing on a downed log. 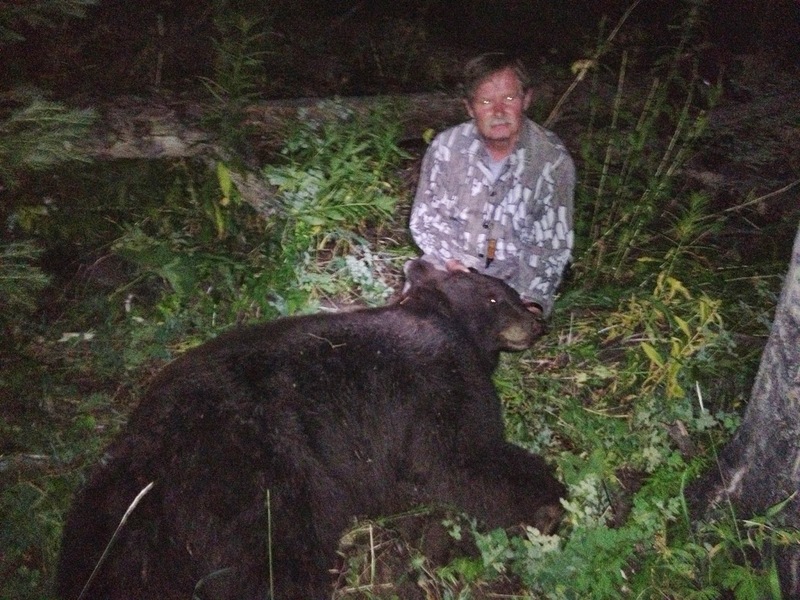 I watched as my mother brought up her 300 Weatherby magnum and sighted on the bear. I saw the rifle round impact the bear in the front shoulder and instantly take it down. After 15 years of carrying around a bear tag in her pocket, the moment had arrived to notch it for the first time. We climb down out of the tree stand and examined the animal. It was medium sized dark brown boar, and certainly an animal to be proud of hunting. That night as we packed the bear out in our backpacks, the rain started falling again, but we didn't care. We had overcome the elements and through determination and patience completed a successful hunt. All of these qualities my mother has faithfully taught me over the years. Mom with the rainy day bear. I have been very fortunate to have my parents as my forerunners. Although others have had a strong impact on my hunting experiences and ethos as well, my parents have been the predominate force. This post is meant as both a tribute to them, but also hopefully to encourage others to be forerunners and trailblazers. In your adventures, do you leave a trail for others to follow and learn from? What will our lifestyle and sport become if we do not pass on all our hard earned knowledge and experiences? Thank you for your kind comments Cornelius!